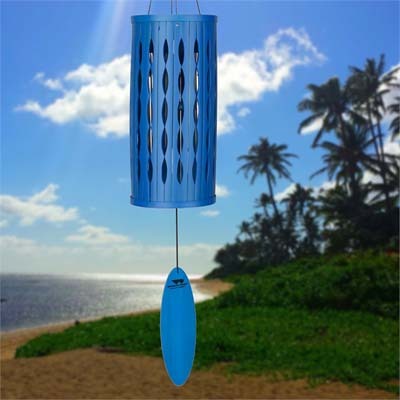 Our Aloha Chime is musically tuned with inspiring notes to uplift your spirit and ease your mind. This chime was inspired by the island paradise of Hawaii. Silver chimes are encased in a bright blue bamboo sleeve. Silver chimes are encased in a Blue color bamboo sleeve. This chime was inspired by the island paradise we call Hawaii where beautiful sunny days are strung together like the flowers on a lei and the people are known for being warm and friendly. Although often used casually, the word aloha literally means "sharing the breath of life". So when used in a greeting, aloha implies a common humanity or spiritual essence. Materials: 4 silver polished aluminum tubes, Blue finish bamboo sheath, coordinating bamboo windcatcher.